First-year students and sophomores studying Japanese gathered on the evening of October 9, 2017, to learn about Junior Semester Abroad (JSA) and Junior Year Abroad (JYA) opportunities in Japan in 2017-18. Seniors who returned from JSA or JYA in Japan talked about their experiences, after a brief overview presentation by Lecturer Keiko Konoeda, also Campus Representative of Associated Kyoto Program. Hilton Chao ’18 encouraged everyone to “explore the world,” while showing photographs taken during JSA at Associated Kyoto Program in Kyoto, Japan. Anh Chu ’18 added benefits of studying in Japan for two semesters, such as an opportunity to conduct an independent research project and an individual trip project. Zhe Luo ’18 and Summer Peterson ’18 told the benefits of living with a local family and practicing Japanese language on a daily basis. Sarah Curtis ’18 shared her experience at Nanzan University in Nagoya, Japan. First-year students and sophomores listened eagerly to the stories from Japan. 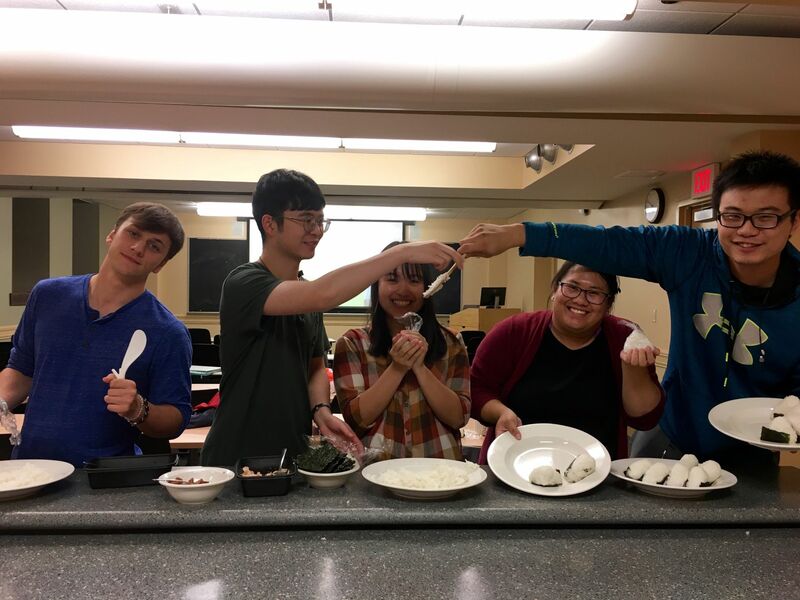 Students enjoyed refreshments of rice balls and miso soup, prepared by student volunteers. Photographed are Michael Lombardi ’21, Zhe Luo ’18, Anh Chu ’18, Ellie Yguico ’20, and Hilton Chao ’18.